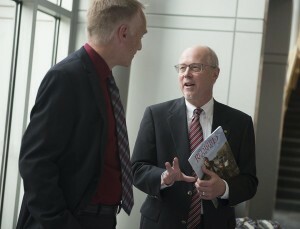 The Redbird Scholar is Illinois State's new magazine focused on faculty and staff research. About 5,000 copies of the 22-page print publication were mailed this week to faculty, staff, other members of the Illinois State community, peer institutions, and select business, government, and nonprofit officials. All of the magazine’s content and a PDF of the magazine are now available online at IllinoisState.edu/RedbirdScholar. The biannual magazine will publish each fall and spring. It features stories, profiles, and Q&As on the most interesting and impactful researchers at the University. Other sections highlight research grants procured by the University, and books and recordings produced by Illinois State faculty. Readers can interact with the magazine by submitting serious or silly questions to our faculty experts. The Redbird Scholar is a rebirth of the Illinois State Scholar. The University’s former research magazine last published in 2002 after a 12-year-run. 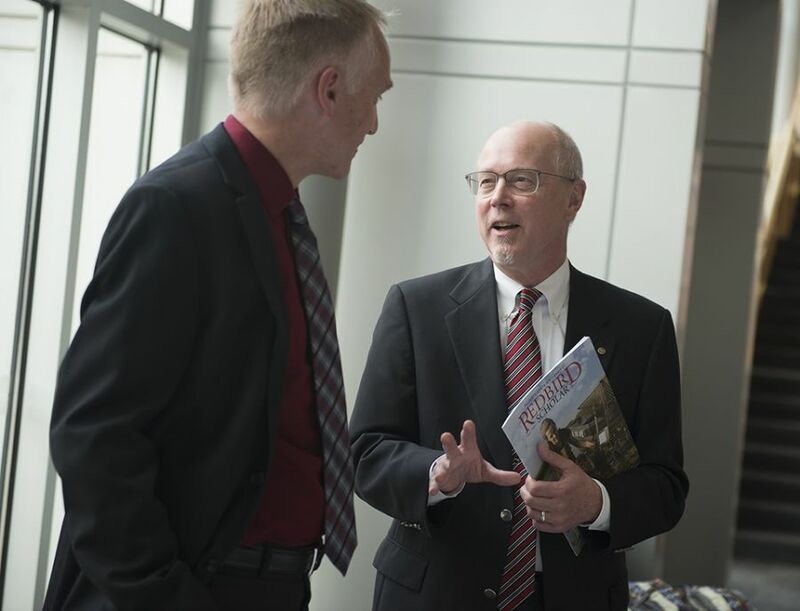 The new magazine was produced by University Marketing and Communications in cooperation with Illinois State’s Federal Government Relations, Graduate School, Media Relations, Provost’s Office, Research and Sponsored Programs, and State Governmental Relations. John Baur talks with WGLT General Manager Bruce Bergethon at the launch of the Redbird Scholar. Illinois State is conducting research around the world. Illinois State students are doing research on important topics like climate science while working closely with faculty researchers. Research isn’t just a professor doing hard science in a laboratory. The University has experts in extraordinarily diverse fields. Professors are bringing in lots of money to the University through research grants. Are you engaged in interesting research? Do you have an upcoming art exhibition or concert? Are you coming out with a new research paper, book, audio recording, or film? Please tell us. We want to hear about it. Contact Editor-in-Chief Kevin Bersett at kdberse@IllinoisState.edu or (309) 438-4329 with research projects that we can feature in the magazine. You can also tweet your research to us at @ISUResearch by using the hashtag #RedbirdScholar. To keep up with research news between issues, be sure to follow @ISUResearch on Twitter and look for more research stories at IllinoisState.edu/RedbirdScholar.